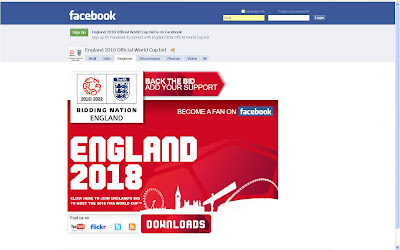 There is also an England 2018 Flickr account, a Facebook Fan Page at www.facebook.com/england2018 , a Twitter account @England2018 and the opportunity to text support too. And for the record, I think England would be a fantastic host country for the 2018 World Cup - back the bid! Is this serious? Is this REALLY what we submitted to host a World Cup? Well, its not great is it? A day's work on iMovie maybe, by cutting some stock football film into a tourist's video of London landmarks and cliches. Where was the cheeky cab-driver, the pearly king and the pie-shop....? That aside, most worrying is that it only shows the West End and West London... what does that say about our intentions? We couldn't really be bothered, so we only filmed within a cab journey radius to our soho edit suite - Perhaps the rest of the country are simply not invited. Perhaps the creative team are all from Chelsea. Whatever, its a poor effort. I won't be betting on our chances. It shows lots of people playing football, but the passion for football in this country doesn't really come across. It's maybe not about Michael Essien looking slick or about England supporters, it's more about the fact that people like me will genuinely watch (and enjoy) matches like Iran against Angola or get up at 6am to watch the Peoples Republic of China play Costa Rica - it's the World Cup, it matters. Euro 96 was a brilliantly supported tournament (why isn't this referenced? ), the cultural diversity of today's UK means every team will have some sort of core fan base and there are few nations who possess the same number of quality stadiums or passion for football as England. Just to put you guys straight... This was a short film shot on a limited budget to show the London clubs' support for the 2018 bid. Hence the title: "London United" You are correct, the rest of the country wasn't invited for obvious reasons.